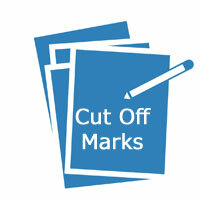 Cut Off Marks is the minimum qualifying marks that the candidates have to secure in the exam. The cut off will decide whether a candidate is selected for the further rounds or not. By knowing the Cutoff marks, you can also estimate your results. Any exam conducting Board will prepare the cutoff marks by considering some factors like Number of candidates appeared for the exam, the difficulty level of the question paper, number of vacancies, reservation policy etc. Moreover, the board declares category wise cutoff marks or section wise cut off marks as per the exam. Here on this page, one can get the Cut off marks for both Government Jobs and Entrance Exams all over India. After writing any State or Central Govt exam, all the postulants are curious about knowing their results. As soon as the answer key for various exams is released, candidates start predicting the probable exam cutoff marks. Since the officials need some time to declare the results they will release the Cut Off marks first. In general, the cutoff is an entry to go into further rounds of selection process. But remember the cut off will not be same for all exams. It may differ from board to board or post to post. And these Cutoff Marks may also vary for categories such as scheduled castes, scheduled tribes, and others. Most of the government exams will have Category wise Cut Off Marks. But some boards set overall cut off and some exams set section wise cutoff marks. Confused, right! don’t worry, I will explain in detail here. All the SSC exams have an overall cutoff. That means the cutoff is calculated by adding the marks secured in all sections. Whereas for the Bank exams, there will be sectional Cutoff marks. That means one should qualify by scoring the minimum cutoff in each section of the exam along with the overall cutoff marks. So the candidates who have got equal or more cut off will be declared as qualified in that particular exam. Candidates will get disqualified if they don’t reach Cutoff Marks. Only those postulants who got qualified are eligible for the further rounds. Each Entrance Exam has different cut off as decided by the exam conducting body. Candidates have been preparing for Entrance Exams since many years. Because they will get admission to various courses if they qualify in Entrance exams. Not only admissions, some entrance exams like GATE also provides job opportunities to the postulants. For this reason, the number of candidates applying for entrance exams is increasing gradually. Here on this page, we are providing the AIIMS MBBS Cut Off, SET Law Cutoff, CET Exam Cut Off marks, etc. But before that one should know What factors are considered for calculating the Cut off of any Entrance exam. Have a look at those in the below section. The performance of the candidates in the Examination. Last year Cut Off Trend.